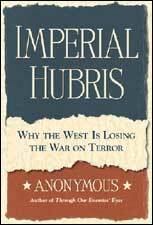 Imperial Hubris: Why the West is Losing the War on Terror by Michael Scheuer (2004). From 1996 to 1999, the no longer anonymous Michael Scheuer headed the CIA's Osama Bin Laden unit, and in his newest book on the subject, "Imperial Hubris: Why the West is Losing the War on Terror," he attacks, often quite acerbically, many of the accepted orthodoxies about al-Qaeda and US foreign policy. He argues that Osama Bin Laden — a hero to millions, if not tens of millions — is not bent on subjugating the non-Muslim world or scapegoating the West for political corruption and development failures in the Middle East. He is simply waging a defensive jihad against America because it supports Israel, Russia, India and other countries that fight Muslim militants. Scheuer argues that the US should reconsider its alignment with these hated nations rather than trying to jumpstart democracy in the Muslim world by toppling tyrants. But since the US is unwilling to forgo its entangling alliances, it will have to fight a war in Afghanistan along the lines of Dresden and Tokyo. Indeed, one gets the impression that the choice is between endless carpet bombing and isolationism. It's been over three years since the fall of the Taliban regime in Afghanistan. Do we see any evidence that the Taliban and al-Qaeda are regrouping and, if so, where? I think the level of attacks, certainly since the spring of 2003, indicates that they have been regrouping, both within Afghanistan and in the border areas in Pakistan. A week ago, I spoke with Hamid Mir, from Pakistani GEO TV. He had been in Afghanistan to cover the recent presidential election, and he noted that at least 16 or 20 of the southern districts through which he traveled were under Taliban control. US military has been basically static throughout 2004. Until a few days ago, it has been mainly the clandestine service and US Special Forces that were trying to search out and destroy the Taliban and al-Qaeda. The combination of not having enough troops in Afghanistan; not having them active enough, and the porous nature of the border have given al-Qaeda and the Taliban the ability to regroup. You criticize the US for treating Osama Bin Laden as a terrorist, and not an insurgent. What's the difference and why is it relevant? Al-Qaeda has also put a tremendous amount of effort into succession planning. It doesn't want to lose leaders, but it expects to lose them. We have seen that, since 2001 and even earlier, whenever a senior leader is captured or killed, he is quickly replaced by someone who may not be as talented but was an understudy. And until we face these facts, we are going to be hamstrung by the idea that, sooner or later, we are going to arrest enough of leaders to eliminate the threat. Ex-CIA officer Marc Sageman argues that the al-Qaeda network could be neutralized if five to 15 percent of its commanders — i.e., men like Abu Zubayda and Abu Doha — were simultaneously taken out. Do you agree? I have great respect for Mr. Sageman's work ... but I think he's too optimistic. First, I don't think we could simultaneously locate 15 percent of their leaders. Second, we simply don't know enough about their communications or how they manage their affairs to make that assumption. Both Presidents Clinton and Bush, and Mr. Kerry during the campaign, have made so much about how many al-Qaeda leaders have been killed, yet at the time, they have warned Americans that a WMD attack in the US is possible. There is a contradiction between trumpeting the damage done to al-Qaeda and still worrying about catastrophe. You argue that al-Qaeda attacked America because of its foreign policy, not its values. If the US were to distance itself from Israel, Russia, China, India, the Philippines and the Persian Gulf states, would the jihad against the US end? My book is a very nationalistic one. What I'm trying to do is to find a way we can combine military and intelligence work with economics, public policy and diplomacy, which will best allow us to crush the enemy. Right now, the only options that America has left itself are military and intelligence ... But at some point, we are going to have to find a way to cut into the Islamist potential for growth. Had Osama Bin Laden never met Egyptian Islamic Jihad leader Ayman al-Zawahiri would al-Qaeda now be targeting the US? Yes. One of the great fallacies of Western analysis has been the idea that Ayman Zawahiri somehow turned Osama Bin Laden...I think that it is very clear that it was the other way around. Zawahiri was always of the opinion that the road to Jerusalem led through Cairo. His goal has been the penetration of the Egyptian military and intelligence services by Islamists and, ultimately, a top-down coup that would destroy Sadat, and now Mubarak. Part of Osama's genius has been getting Islamist movements to shift their focus from national targets and to the United States. His argument is that Arab regimes have no qualms about using massive force and are immune to public and international criticism, so it's a losing battle to attack them. Instead, the Islamists should focus resistance on the US because he believes that, without American economic, political and military support, those regimes and Israel would fall of their own weight. Are the Afghans capable of setting up a stable democracy, or is another Islamist regime for the country a foregone conclusion? As a historian, I hate inevitability, but it seems to me that democracy of the sort wanted by President Bush and President Clinton before him is not in the cards. The country is dominated by tribes and millennium-old ethnic rivalries and hatreds. It is a very conservative Islamic country and one that is much more now that it was before the Soviets invaded. There's no market for secular democracy outside of President Karzai's Kabul. Must it be a "secular" democracy? It certainly can be some form of democracy, but I don't think that we have reached a final settlement. The election victory for Karzai was not really a vote for establishing democracy. Karzai is a Pashtun, so he won the Pashtun vote. But I don't think he's widely respected in the country...What you really saw in the election was the drawing of lines that will result in civil war and probably an Islamist government under a name other than "Taliban." Americans forget, as they did regarding Iraq, that Afghanistan is not hermetically sealed. It's not just a matter of getting some sort of democracy established there; you also have to figure out how to stop outside influence. Uzbekistan, Iran, Russia, India and Pakistan all say they want a stable, peaceful regime in Kabul, but none of them have the same definition of what that means, so you are going to have various tribes and ethnic groups in Afghanistan supported by outside actors. What indicators would you look for to chart the political fortunes of the new Karzai government? We will see an increasing amount of foreign interference. The Indians are already active in Afghanistan. You will see more support for Defense Minister Fahim from the Russians...Finally, the Pakistanis, in the long run, will not tolerate a government in Kabul that is not Islamist, a government that is friendly towards India, Russia and Iran. Karzai will have a lot of problems from the narcotics traffickers if he tries to stop the heroin industry...His support comes mainly from those who are not representative of Afghan society — from technocrats, ex-Communists, and expatriates who have returned from southern California, Germany and India. Does the current crop of insurgents have deep-pocketed foreign backers like those during the days of the Soviet occupation? The huge windfall in profits from the increase in oil prices from $30 to $50 a barrel roughly coincided — and I am not suggesting a conspiracy, just serendipity — with the Ramadan and Eid holidays. That meant more money for the jihads in Afghanistan and Iraq. You argue that, for the lack of allied militias, the US must increase troop levels in Afghanistan and be ready to kill a lot of civilians. But would that not be repeating the same errors of the Soviets? Sure. I don't think we would be as brutal as the Soviets, so we would probably lose. I'm really not a bloodthirsty individual. But my point is that America has put itself in a box, and it is only left with the military and intelligence to fight this war. Now I have recently read about a large offensive in Afghanistan, one with 18,000 troops. It sounds good, but winter offensives in Afghanistan generally don't produce much. Maybe this offensive indicates a change in military strategy. In December 2000, then-US president Bill Clinton proposed an independent Palestine in 97 percent of the West Bank and in all of the Gaza Strip. Why did that not sooth Muslim anger over America's backing of Israel? I think it might have if it had come about. You can clearly blame Arafat for that. Maybe with Arafat gone there is a short window of opportunity. Why did al-Qaeda only start attacking Israeli targets in October 2002? He also views Israel as a Crusader outpost and America as the key to Islamist victory, so that has prevented him from devoting a great deal of resources in attacking Israel. One of the major debates between [captured al-Qaeda field commander] Abu Zubyada and Osama Bin Laden has been the orientation of al-Qaeda; Abu Zubyada wanted to shift focus to Israel. If Osama had shifted to Israel too early, he would have lost sight of the "far enemy." He is still only 60 to 65 percent successful in focusing the Islamic movement's attention on America, which is why we should kill him as soon as we can. With that forceful personality gone, there may be slippage: Algerians will go home to fight their government; the Egyptians will back to trying to assassinate Mubarak. Do American Jews have the best interests of the US at heart when they lobby for foreign aid and diplomatic support for Israel? It doesn't do Israel or America any good to have the perception in the Islamic world that the Israeli tail wags the American dog. Israel's ability to control discussion in the United States is astounding to me. It's a tremendously successful covert operation. But over time, Americans will get tired and angry about not even being able to discuss foreign policy towards Israel — and not just Israel but Saudi Arabia too. I think that, at this point, few people in America entertain the notion of abandoning Israel as an ally. But I think that over time, if there is not an honest debate over foreign policy and Americans keep getting killed by Islamists, there will be a faction that develops that does indeed oppose the relationship. What is your opinion of the thesis propounded by historian John Lewis Gaddis, that the neoconservative notion of preemptive war has deep roots in early American political thought? I'm not sure it has deep roots in early American political thought. What does have deep roots is addressing issues when they arise and not after they have become a huge problem...What a benefit it would have been for the US, Israel and the world if America had killed Osama Bin Laden in the 1990s! Neoconservatism is an admirable way of dressing up unclear thought. I don't think that preemptive war has any roots in the American tradition — or, at least, I hope not. I would hope that the American political tradition is more decent than that.